Eko are a Spanish manufacturer who made a modest range of figures as well as cars, tanks and other toys. They were sold as HO scale and were generally factory painted to a very low standard. Many were straight copies of figures from other manufacturers such as Airfix, but some were genuinely original, so we present here a rundown of the full military range. Image courtesy of Toy Soldier HQ Inc. This set has a very familiar look to it, being one of the many copied from the original Herald set. Some quality was lost during the copying, and the figures were sold with the faces, hands and boots already painted. The bag contained one of each of the eight poses shown. See also examples of packaging. Today the original of this set is marketed by A Call To Arms. This is one of the original sets this company produced. The eight poses show the Spanish Foreign Legion in action, presumably for the civil war period. It would seem that these were available both unpainted and with a very basic factory painted finish. While we have not seen these figures in the flesh (hence the composite picture above), they look like they are of a good standard. See also examples of packaging. Another familiar set, this time a direct copy of figures from the Airfix first type WWII German Infantry set. Eight poses with hands, faces and weapons painted at the factory. See also examples of packaging. This one is original as far as we know, but a very poor affair. Weak sculpting and plenty of flash, and the less said about the bright yellow 'flesh' paint the better. See also examples of packaging. More copies of figures from the old Airfix first type WWII German Infantry set. Eight poses if you include the 'anti-tank gun'. Presumably impossible to distinguish from genuine Airfix figures once out of the packaging. See also examples of packaging. This is another original set from Eko, and again the sculpting is crude and the level of historical accuracy very low. Basically just men in a generic form of battledress with generic kit and a very brief factory paint job. Everything about them reminds us of the Airfix Infantry Combat Group and other first type Airfix sets, so nothing to get excited about here. See also examples of packaging. Back to familiar territory now as the ever popular Airfix range is raided once again. 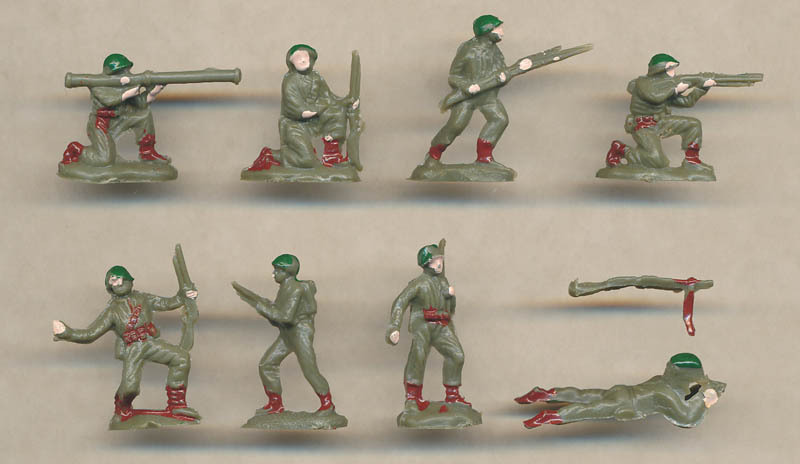 Here we find eight poses from the first type Eighth Army set. With this set you got marginally more paint as there is more exposed flesh, and from the look of this picture you sometimes got a particularly revolting shade of green, although a sand colour seems to have been more common. See also examples of packaging. More of the same, with another selection of poses from Airfix Eighth Army. See also examples of packaging. This is another unique set, and a very surprising choice of subject. Why the Swiss were chosen is a mystery, and while they had the advantage of not having been done before (or since), the same could be said of many much more obvious subjects at the time. The standard of sculpting and production is much the same as the rest of the range, as are the poses, which seem typical of this period in the history of plastic figures. Another one for the collector only really. See also examples of packaging. This one was clearly meant to populate all those vehicles you can buy with no one inside. The quality of these figures is really poor, and the poses are limited to two single figures with rifle on right or left side, plus a pair with one man having his arm round a colleague's shoulder. Detail is practically non-existant, and they are absolutely tiny too. If they were to stand then they would be no more than 18mm tall. This makes them a bit small even for the HO scale vehicles they were supposed to inhabit. We can't see a stampede to buy this one. See also examples of packaging. It is only natural that a Spanish company would want to make Spanish troops, so this original set was the result. Our guess would be that these were 'modern' infantry, although the period was probably not particularly important as most children would have them fighting the Germans, British or whoever came to hand. Another crude collection by today's standards, but as toys they doubtless performed more than adequately. See also examples of packaging. This set is something of a surprise in several respects. First of all, it is really quite decent. OK so the poses are flat and dull but the sculpting is pretty good for the time and detail is not bad either. For some reason (perhaps to make them more obviously Russian) all the figures have been given the ushanka cap, and all are wearing a nice double-breasted greatcoat. The officer is particularly interesting as he appears to be wearing a budionovka cap, although the detail is not good enough to be sure. The budionovka was a pre-war cap much seen during the civil war and after, yet at the time of writing this is the only infantry figure made wearing one. Our examples are rather disfigured by the very poor factory painting, but these are not at all bad if they are cleaned up or unpainted examples can be found. These are more original figures, but they are quite generic WWII figures and the only thing that makes them paratroopers is the parachutes themselves. The man dragging in his chute is very nice, but the rest are fairly run of the mill, and the quality is only adequate. See also examples of packaging. More of the same here, but a couple of very unusual poses. The man firing while clinging on to his chute seems quite unlikely but fun nonetheless, and the first figure on the second row seems to be coming in to land, although his chute is clearly snagged on a bush so he is presumably in for a nasty jolt. This second figure in particular has a very rounded parachute - not at all flat as you might imagine, and despite being moulded from the side the man is quite a good piece. In the 1/72 scale parachute stakes these are some of the best! See also examples of packaging. Once again it is apparent that Airfix figures have been pirated, this time from their first type Commandos set. Well that is not a great set to begin with, so these can't have much going for them. This is definitely in the unusual category. The figures wear a generic battledress much resembling that of Britain, plus of course the shemagh, although detail on all these items is not good. The Arab Legion were a small police/military force in Transjordan that supported the Allies in World War II by fighting the French in Syria, then in 1948 they fought the Jews in Palestine, and afterwards were a security force in Jordan. This is a subject that has still to be done by anyone else, but while the sculpting quality is not good a couple of the design decisions are very strange. One man is waving a small flag, which does not fit comfortably with the period, and another, whom we take to be an officer, is holding a large bird on his left hand. This is presumably the regimental mascot, a hawk, but is far too large, and in any event it was not carried into battle like this. Presumably done from the Osprey book on the subject, this remains the most exotic Eko set. See also examples of packaging. Now it seems Eko expanded their copying horizons, and introduced this version of the Atlantic Anti-Tank Troops set. Again, not a great set to copy so not an impressive result. See also examples of packaging. This is another copy of some Atlantic products, this time mostly their Machine-Gunners and Mortars set. See also examples of packaging. Eko also made a wide range of tanks, vehicles (both military and civilian), aircraft and other toys. 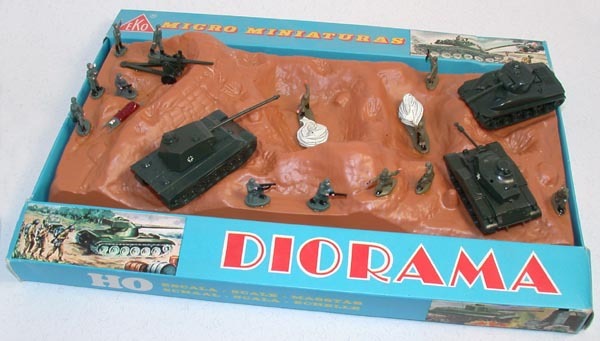 They made several dioramas such as the one pictured above, which had both figures and vehicles glued to a plastic base with a clear plastic cover. However it is their unique figure sets that make them of interest for our site.